Share what you thought about One Night With You and earn reward points. One Night With You is all about being so overwhelmed with grief and needing someone to show you they care, even if it’s not real. We all have our own ways of dealing with grief but it’s especially hard when the one person who is supposed to be there for you turns around and blames you for something that you clearly have nothing to do with. I cant urge you strongly enough to get a copy and find out if Tate and Raine find a love that is strong enough to withstand Tate’s tour overseas. 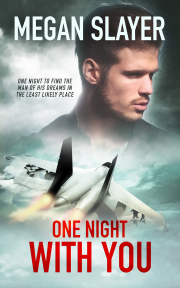 One Night With You is all about being so overwhelmed with grief and needing someone to show you they care, even if it’s not real...I cant urge you strongly enough to get a copy and find out if Tate and Raine find a love that is strong enough to withstand Tate’s tour overseas. This author did a good job on this story. This was really a good short story. It really left an impact on me to remember it so well from reading it previously. This was one of my favorite stories in the anthology. It is nice to read a book about something good coming from such a tragedy as The one in this book. Great read!! A short and sweet story with the sharp sides of life in it. The writing was in a smooth pleasurable way.